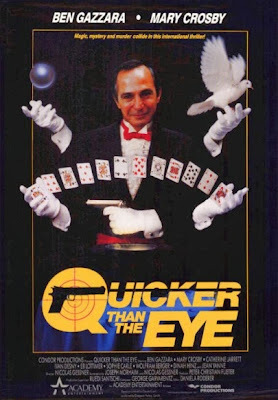 Quicker Than The Eye is a slow paced, but fun, mystery. Ben Gazzara stars as a down on his luck magician. When he is sent to a foreign country, he is framed for murder. Does he have enough tricks up his sleeve to clear his name? Ben Gazzara is very low-key in this. The plot doesn't go anywhere until the last 40 minutes, but the climax is fun though. The worst part of the movie was the ending because it comes out of nowhere. In the end: It's an okay thriller, but not worth seeking out. Killing Of A Chinese Bookie (1976), Road House (1989), or Pursuit (1972) are better Gazzara films.